On June 23rd, 2011, the U.S. Consumer Product Safety Commission and Health Canada, in cooperation with Britax, announced a voluntary recall of their B-Nimble baby stroller due to a brake defect. An audible click heard when the brake pedal is pressed can give a false impression that the brake is fully engaged when it is not. When the brake is not engaged, the stroller can move unexpectedly posing a risk of injury to the child occupant. About 20,000 of these strollers were sold in the United States and 800 in Canada at various juvenile product and mass merchandise stores nationwide and online retailers between September 2010 and June 2011 for about $200. As of June 23rd, 2011, Britax has received seven reports of the brake not being fully engaged. No injuries have been reported as of this same date. This recall involves B-Nimble umbrella strollers manufactured on or after August 1, 2010. 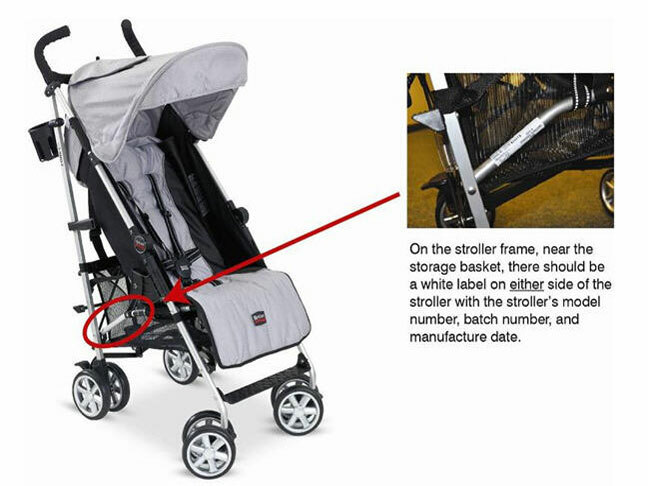 Strollers included in the recall have model numbers U311771, U311773, U311775 and U311780. The date of manufacture labels and model numbers can be found on the lower frame/tube on either the left or the right side (as illustrated in the image shown above). The strollers were sold in a variety of colors including black and silver, Cowmooflage (black and white), green and red. Consumers should immediately stop using their strollers and contact Britax for information and to request an improved replacement stroller. Consumers who resume use of their strollers while awaiting the replacement should always ensure that the brake is fully engaged. For additional information, contact Britax toll-free at (888) 427-4829 between 9 a.m. and 5 p.m. ET Monday through Friday and, or visit Britax’s website. Note: Health Canada’s press release can be viewed here.